Clean – Non-staining gel lubricant. Won’t stain clothing, carpet, or sheetrock. Easy – Can be applied by hand. High Cling Factor – Stays on wires during application. Will not cold flow. Temperature Stable – No ruined lubricant from freeze/thaw exposure. 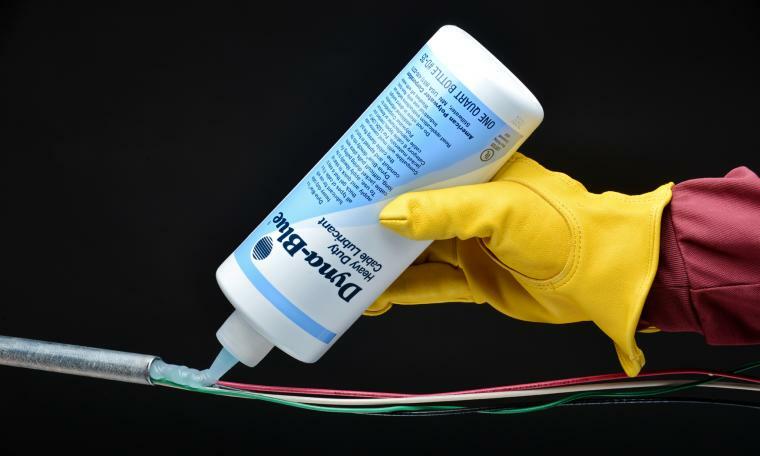 Wipes Clean and Dry – Wire markers stick to cable jackets. * Dyna-Blue® Lubricant is not recommended for LSZH/LSHF and certain CSPE and CPE cable jackets. For these jacket types, Polywater® LZ is the recommended/approved product. Dyna-Blue® Lubricant is a clean, slow-drying, easy-to-apply gel for hand application. It is a thick gel with “clingability” for easy handling and application. Dyna-Blue® combines effectiveness with economy. It is a good lubricant for everyday use in general electrical applications. Dyna-Blue® Lubricant does not cold flow down vertical conduits. It wipes cleanly off cables, allowing wire markers to stick. It dries slippery with <5% residue so cables aren’t “cemented” in the duct. It is a stable gel that won’t degrade and turn runny in its container over time. Polywater® Dyna-Blue® Lubricant can also be pumped using the LP-D5 drill-powered pump (see sidebar).